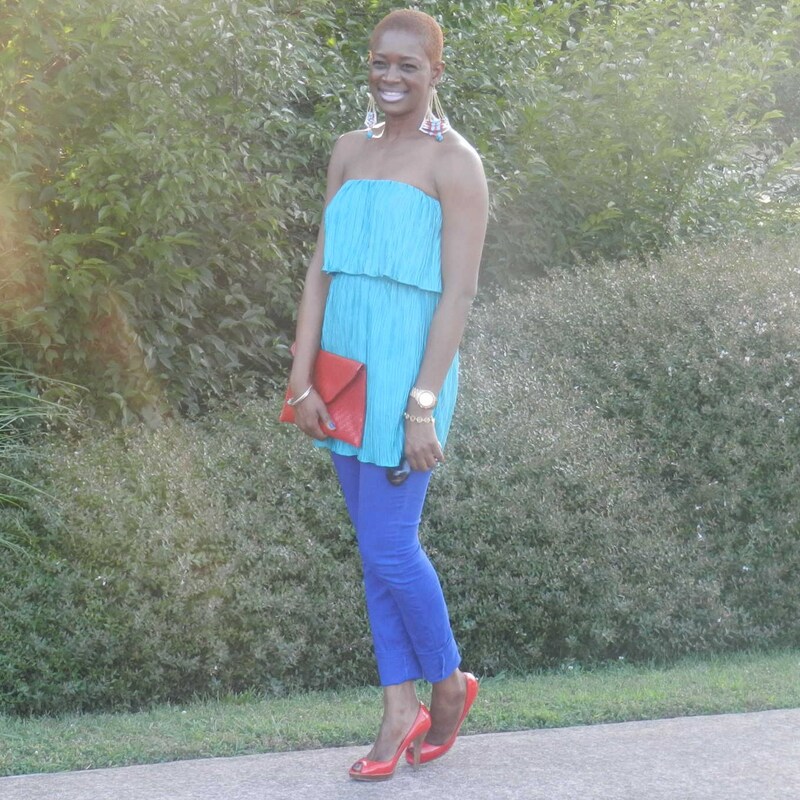 This week's Fabuless Thrifter is Otissa of Fashionably Me!. 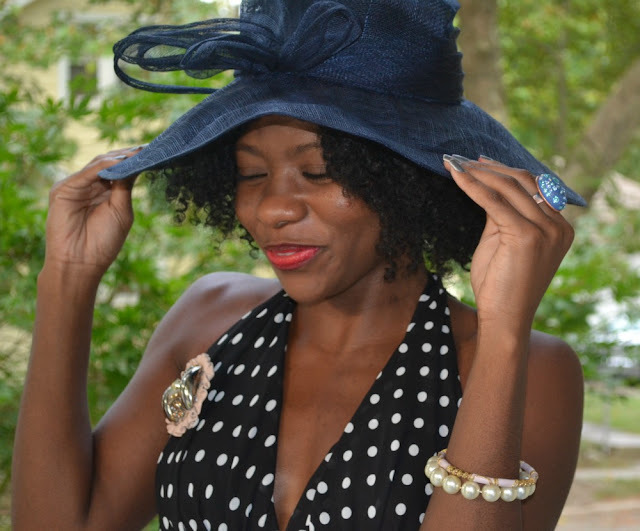 Based in Charlotte, Otissa inspires women to be fashionable on a modest budget through her blog and in-home fashion parties. She loves mixing vintage and modern pieces. 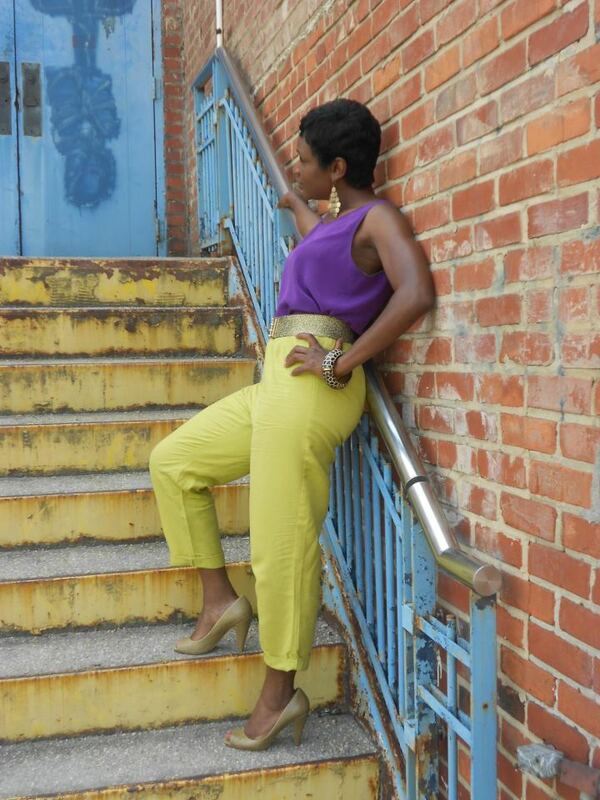 "This lime green and purple outfit was inspired by a picture in Lucky Magazine," she said. " I think I channeled it well!" I am in love with one of the Value Villages here in Charlotte, N.C. This particular store has a ton of vintage pieces and bold accessories. I am sure to leave with something every time I visit this store! I have been thrifting since I was a young girl. I remember tagging along with my parents to yard sales and flea markets way back when. When I was a teen, my grandmother worked at a Value Village. I loved going there while she worked. It’s finding unique and exclusive vintage pieces. There’s nothing worse than going to a function to find someone wearing the same outfit. I also love to change the look of an item. I often cut the fabric from longer dresses to shorten them or tapper a pant leg. A pair of authentic Gucci pumps that I nabbed from a consignment boutique for $60! Be sure to connect with Fashionably, Me! on Facebook and follow her on Twitter too. Remember when Mr. 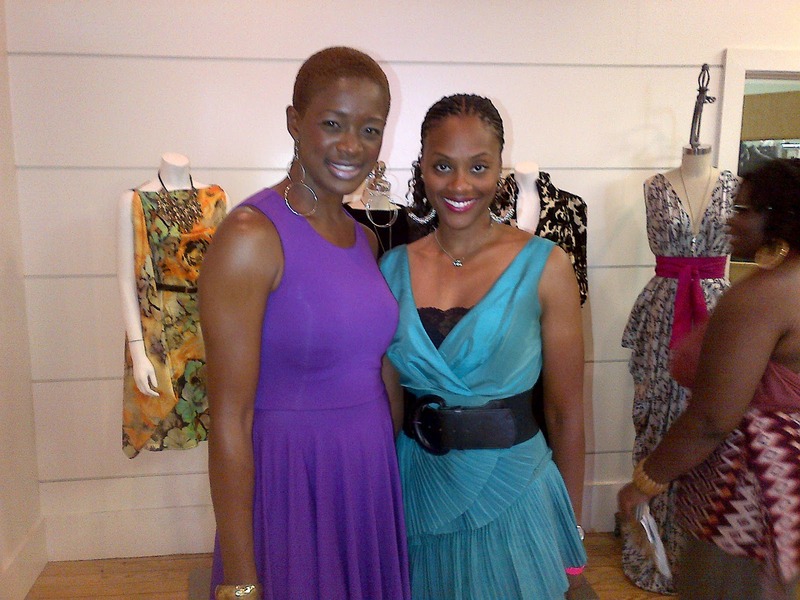 Goodwill Hunting hosted the launch party in Atlanta for I Love Thrifting Day 2012? Back then the date seemed so far away. But now, I can't believe that the day is exactly 14 days on Saturday, July 7th. 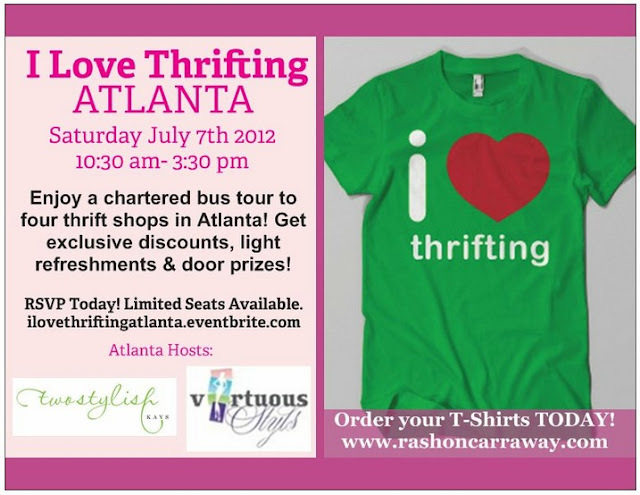 I am so excited to be one of the hosts for the I Love Thrifting celebration. 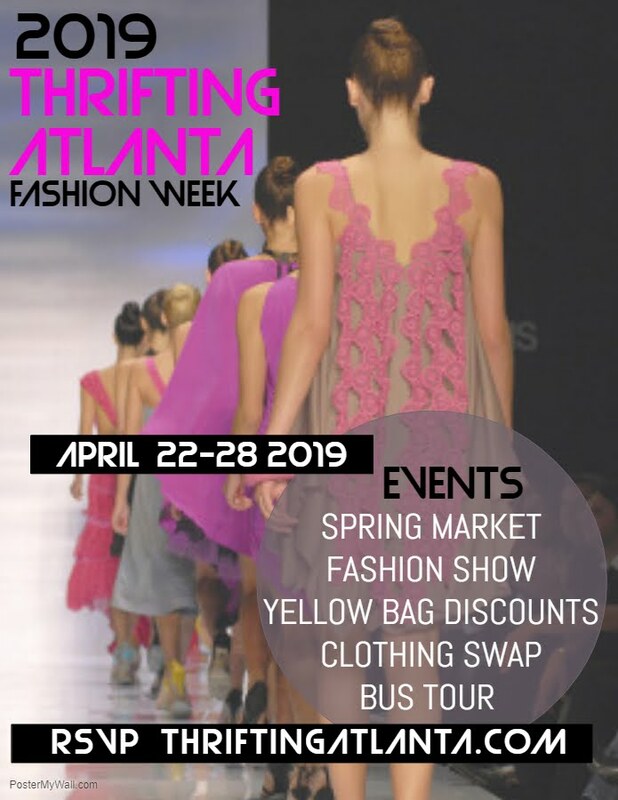 Virtuous Styls and I will be taking a bus filled with thrifting newbies and experts to four of our favorite thrift shops in Atlanta. They will enjoy being chauffeured on a super comfy bus, light refreshments and door prizes. Plus each store is providing special discounts for our group! If you are in the Atlanta area, feel free to join us...click HERE to secure your seat on the bus. 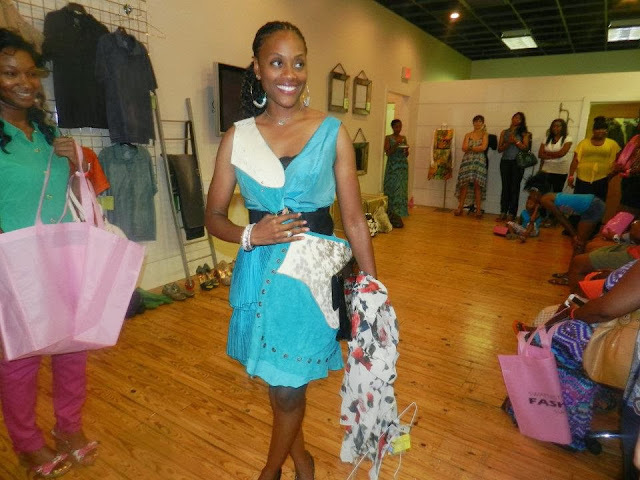 Last weekend, I had the pleasure of hosting Swapnista Fashion Swap Party in Little Rock. 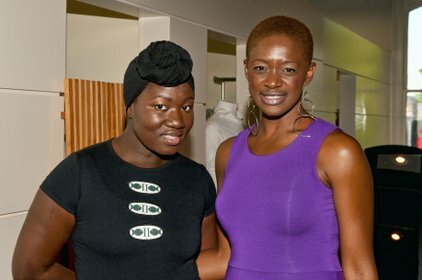 Project Runway alum Korto Momolu graciously opened up her design studio for our intimate affair. 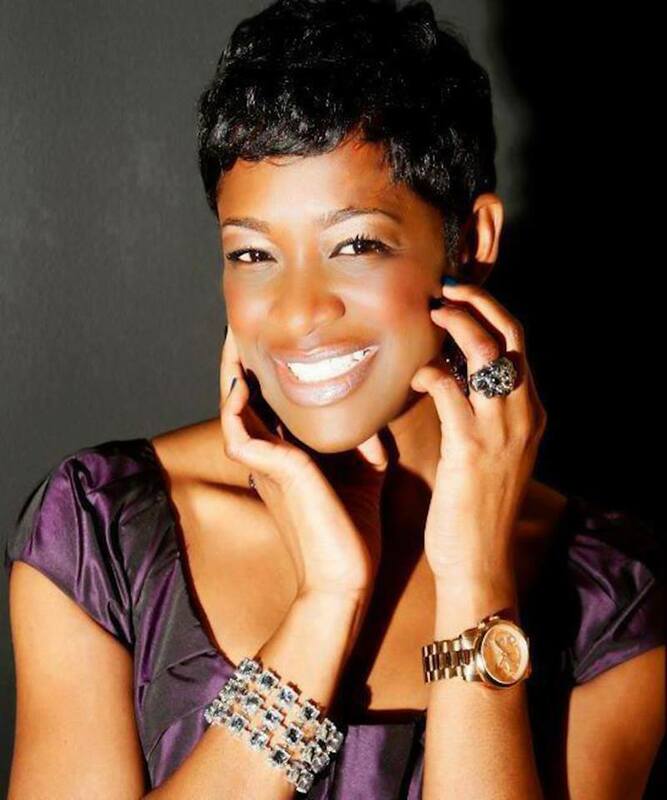 My Little Rock coordinator Michelle Smith, worked tirelessly behind the scenes to ensure Swapnista was a success! Swag bag sponsor, Jade of SoJaded Makeup provided make-up samples for our attendees. 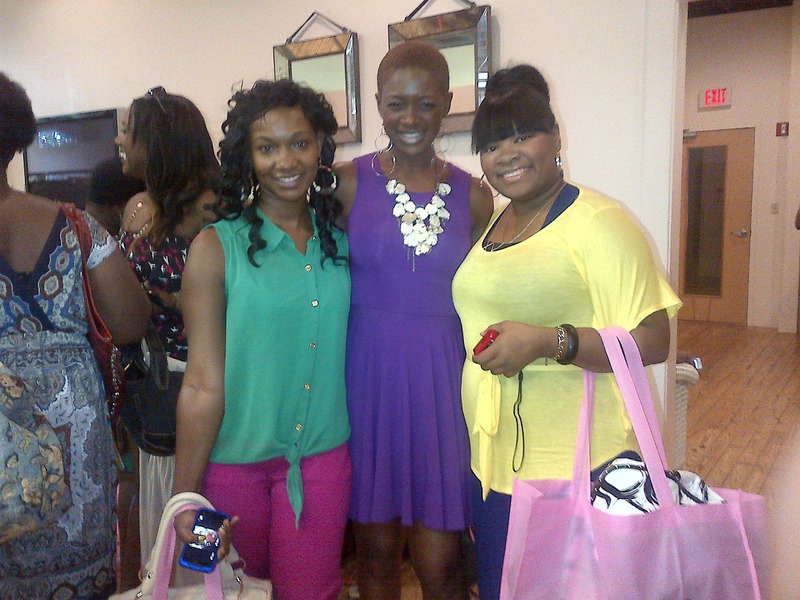 We Love Colors was also a swag bag sponsor. They provided leggings for our attendees. 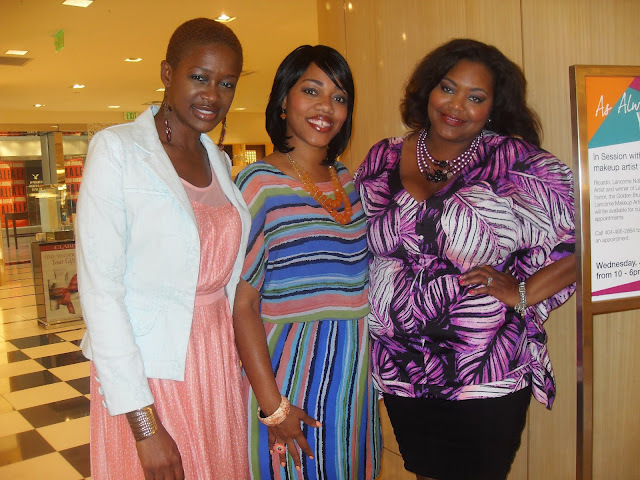 The lovely necklace I am wearing was formally owned by Accessory Designer Marlo Carter. Yes I got my swap on before the entire group. The necklace made my outfit pop. Below are the Little Rock Bloggers who participated in the Style Wars Challenge. Our team is busy organizing the Swap Boutique with all the new-to-you fashion donated by our attendees. The ladies wait patiently for the fashion swap to begin. Ready! Set! Go! The Swap Boutique is open for swapping! The ladies selected up to three items during the first round of the swap. During the second round, which we call the free for all, the ladies can take as many items as they like. Happy swappers showing their Swap Finds!! I had such an amazing time bringing Swapnista to Little Rock! We will be back in August to launch our fall tour! If you would like me to bring Swapnista to your area, shoot me an email or comment below. I love how the shoes give a pop of color that is a shocking, but pleasant surprise. And my vintage Fendi clutch, is my go-to purse this summer because it has straps that allows me to wear it as a cross body bag too. And this is me and my handsome graduate Marcus. I am so proud of the young man he has become. I still remember meeting him when he just four years old. Even though his father and I are divorced, I always told him that I would never miss this important day of his life. He is getting ready to take his ASVAB tests to qualify for enlistment in the Air Force, so please keep him in your prayers. 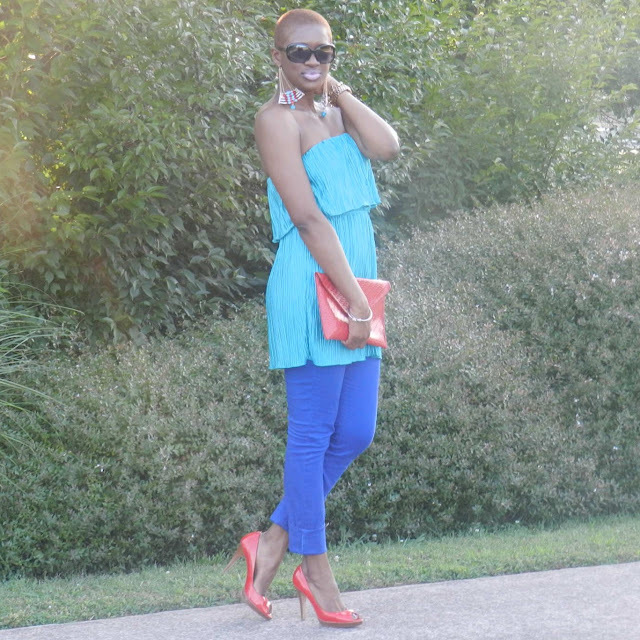 Click HERE to see how the other bloggers rocked the Neon Challenge! This week's Fabuless Thrifter is Patrice of Looking Fly on a Dime. Based in New-York City, Patrice's blog offers readers tips and tricks on how to look their best no matter their budget. She has appeared on the The Nate Berkus Show and is the Savvy Shopper Reporter for WPIX-TV. If she had to choose her favorite place to thrift it would be the Housing Works Buy the Bag sales in Long Island City, New York. "The sale can be a bit competitive but when a thrift store offers a bag full of clothing for $20, it can get a bit heated!" she said. "I've managed to stuff up to 35 items in one bag, so individual pieces end up costing less than $1...this is where I go when I want serious bang for my thrifty buck." She has been thrifting off and on for 10 years, but seriously started thrifting about 3 or 4 years ago. "The most exciting thing about thrift shopping is the treasure hunt aspect," she said. "When you walk in to a secondhand shop, you never know if you'll walk out with a designer piece that costs a few dollars or a one of a kind vintage garment. 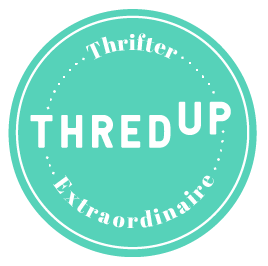 There are so many possibilities when it comes to thrifting." The dress and hat are from the Housing Works Buy the Bag sale: $2 total. My favorite piece has to be the dress. 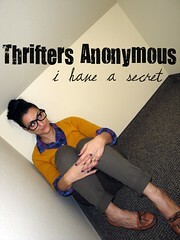 Many people think thrift stores have outdated, crappy clothes but that's so not true. You can find tons of trendy pieces there. 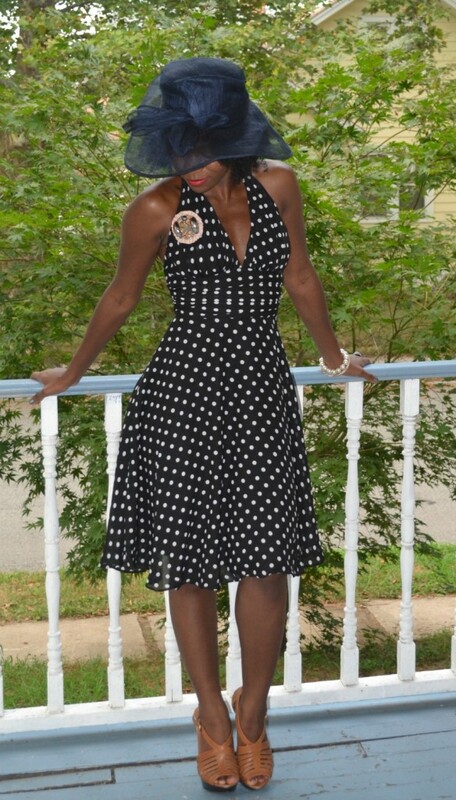 Polka dots are a huge trend and a halter style dress never goes out of style. Though it's a modern piece, it has such a vintage, glam feel to it. I love wearing girly, flirty dresses that flatter my figure without showing off too much skin. The look's classy, chic and cool, which is always a good combo. This is my perfect brunch with the girls look. One of my fave, "fabuless" pieces would have to be a military style Theory jacket. The jacket was just $1 but originally retailed for a few hundred. This is what I call a thrift store score! What do you think of Patrice's fabuless look? Follow her on Twitter and Like her on Facebook too! Last weekend, I attended our church family cook-out at Willis Park in Alpharetta. 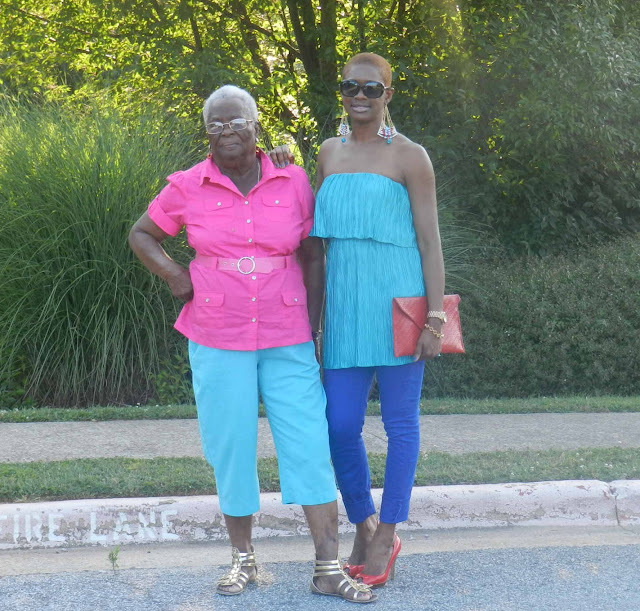 I was too tickled to see my granny rocking the color block trend. Doesn't she look stylish? She is truly one of my fashion inspirations. 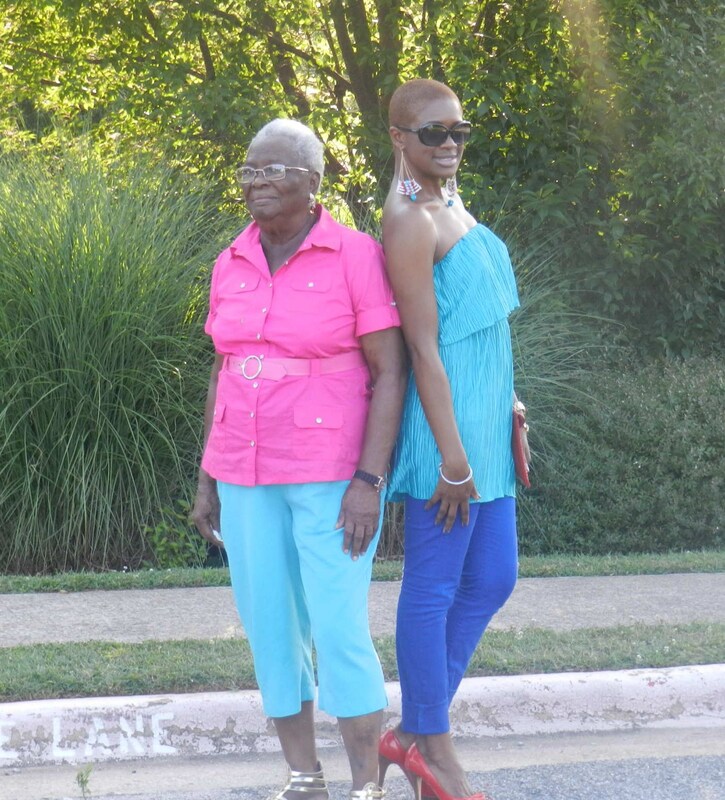 At 90-years old she always manages to stay on trend without even trying. Plus she still looks age appropriate. I promise you she selected these pieces without even thinking twice about color blocking. She is just that fab! And of course, it was such a coincidence that we complemented each other! Great minds think alike. I have had this teal dress (worn as a top) for almost 2 years now! I purchased it from Kesha Denise of Funky Flair Boutique. It is one of my go-to pieces for spring/summer. I love the color and easy forgiving fit. I especially like that fact that I can wear it as a dress or a top. There is no better feeling than having a piece that can transition into multiple looks. Oh...and not to mention that the dress has straps too. I just tucked them in to create a strapless look. When I wear the dress as a top, I usually add black opaque leggings, but this time I opted for my cobalt blue skinny jeans and red shoes for an extra pop of color. 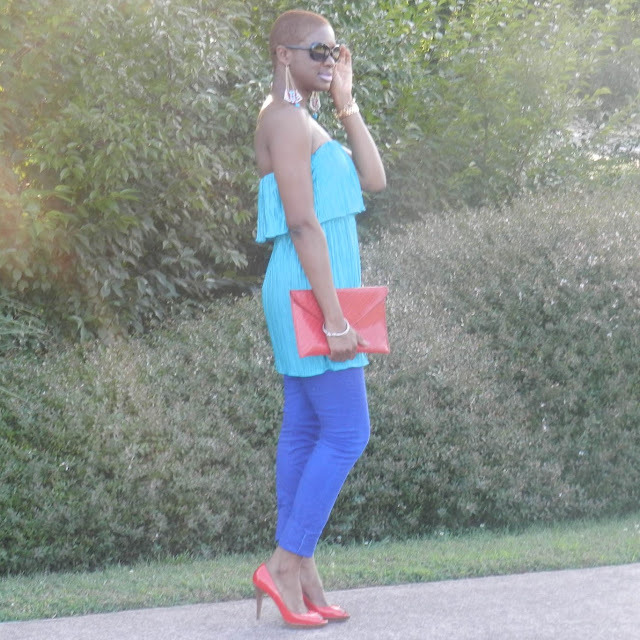 Color blocking is such a bold and creative way to dress. It is such a great way to add color to your wardrobe. As long as you stick to 2 or 3 solid chunks of color and keep the accessories minimal. You will be able to pull off one of the easiest trends this season. Do you have a technique for color blocking? Or do you just experiment with different color schemes?